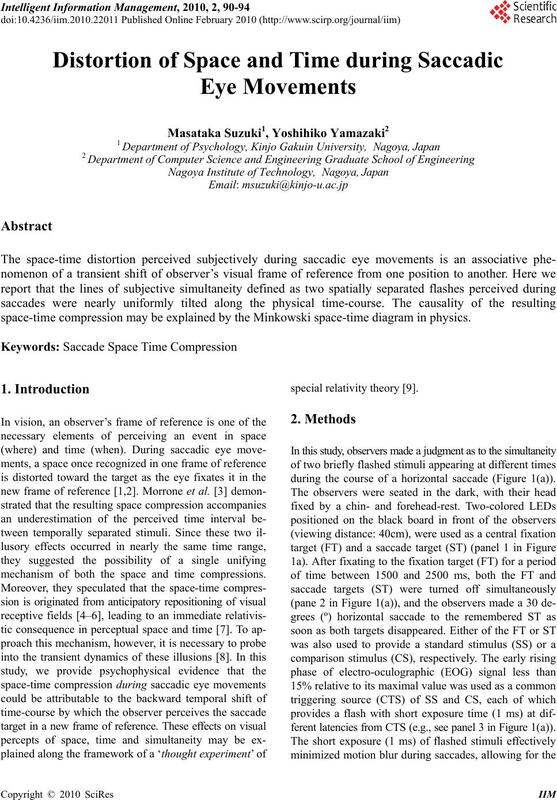 space-time compression may be explained by the Minkowski space-time diagram in physics. mechanism of both the space and time compressions. during the course of a horizontal saccade (Figure 1(a)). ferent latencies from CTS (e.g., see panel 3 in Figure 1(a)). sessions in each latency condition. used in Cond. 1 and Cond. 2, respectively. solid and dashed lines in Cond.1 and Cond. 2, respectively. ment times for all tasks and subjects. tionship to eye position, similar to the Cond.1. earlier than the FT flashes across the saccadic period. present experiments. For details, see text. the space axis x’ as simultaneous (e.g., see clock b and c). contract in the direction of motion (space compression). 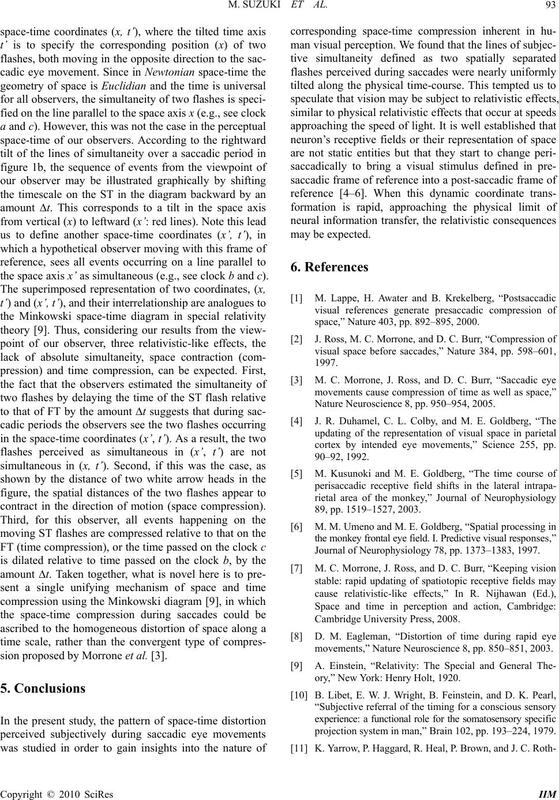 sion proposed by Morrone et al. .
space,” Nature 403, pp. 892–895, 2000. Nature Neuroscience 8, pp. 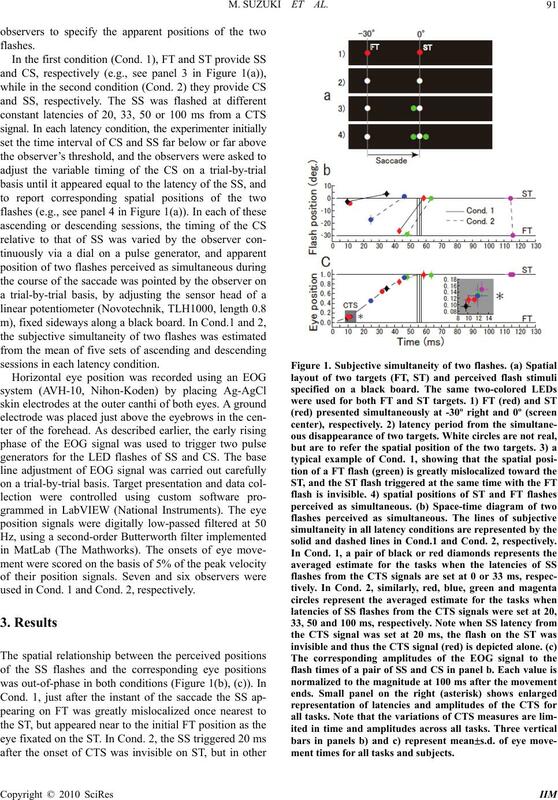 950–954, 2005.
cortex by intended eye movements,” Science 255, pp. 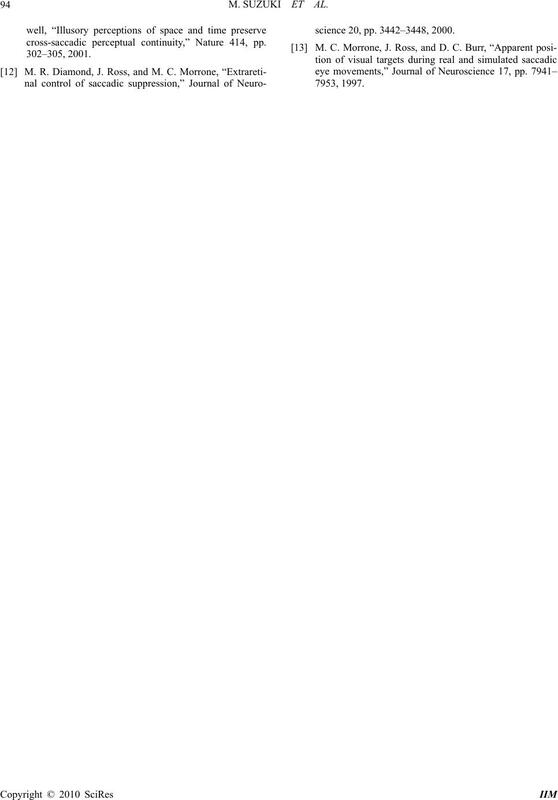 Journal of Neurophysiology 78, pp. 1373–1383, 1997.
movements,” Nature Neuroscience 8, pp. 850–851, 2003.
ory,” New York: Henry Holt, 1920.
projection system in man,” Brain 102, pp. 193–224, 1979.
cross-saccadic perceptual continuity,” Nature 414, pp. science 20, pp. 3442–3448, 2000.